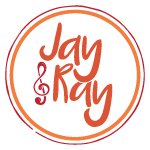 "Ray and Jay, you have opened up the world of music to my son in such an appropriate and inspiring way. For all the music I try and play for my son from Apple Music or Spotify, his favorite jams are those with which he has grown up from your class. We drive by the CVS parking lot and he goes "Shaky Shaky" from the back seat! [...continued...]"